Jawfishes are members of the Opistognathidae family, encompassing only 3 genera. Jawfish are a commonly kept group of fishes due to their funny antics, relatively small size and ease of care. The Yellowheaded Jawfish (Opistognathus aurifrons) is one of the most commonly sold jawfish species in the aquarium trade. Other commonly available species include the Bluespotted Jawfish (Opistognathus rosenblatti), and the Blackcapped Jawfish (Opistognathus randalli). Jawfish are found in the tropical, Atlantic, Pacific and Indian Oceans. They are elongate in shape and generally a small fish, averaging about 4” (10 cm) in length, though the largest species is known to reach nearly 20” (500 cm)! Jawfish are generally found living in burrows which they construct themselves. Burrows are constructed from depressions dug in the sandy substrate, and the jawfish will use its mouth to create an entrance tunnel composed of rocks and bits of coral skeleton. One of the most fascinating aspect of Jawfish biology is their mode of reproduction. Male Jawfish will brood the egg mass in their mouth in order to provide protection from predation. Jawfish can make great aquarium inhabitants, provided their husbandry needs such as diet, water quality and tank space are met. Because they construct their burrows in the sand, it is advisable to provide a generous sand bed as well as ensuring no rocks can be tumbled by the burrowing jawfish. Most jawfish prefer a temperature range of 72F (22C) to 80F (26C). Jawfish are generally considered reef safe. 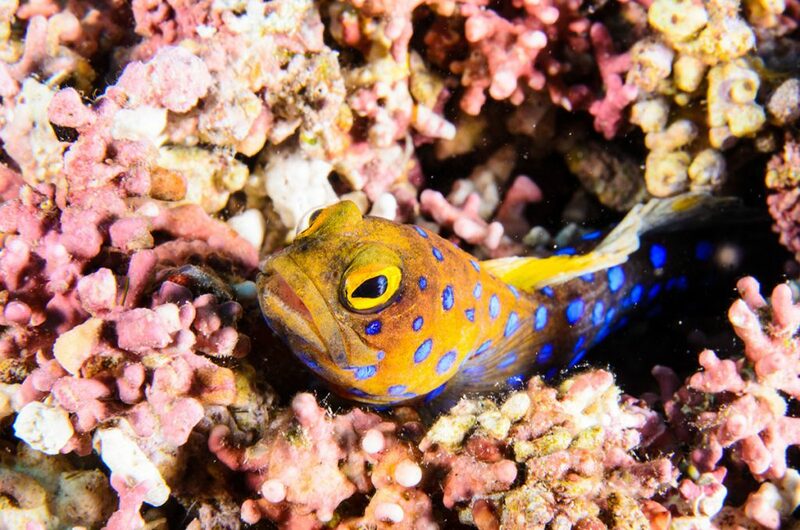 It is important to consider carefully what species of jawfish may be best for your aquarium. While some species such as the Yellowheaded Jawfish (Opistognathus aurifrons) are suited to being maintained in groups, other species such as the Bluespotted Jawfish (Opistognathus rosenblatti) are very aggressive towards conspecifics.